New York, N.Y. (April 21, 2017) – The ASPCA® (The American Society for the Prevention of Cruelty to Animals®) honored Board Member and supporter Linda Lloyd Lambert at the 20th annual ASPCA Bergh Ball last night at The Plaza Hotel (770 Fifth Ave.). Acclaimed fashion designer Isaac Mizrahi served as Master of Ceremonies, and Samantha Ronson kept the crowd dancing throughout the evening. After a glowing introduction from ASPCA President and CEO Matt Bershadker, he presented Lambert with the ASPCA Henry Bergh Award. Named after the ASPCA’s founder, the Henry Bergh Award honors individuals who exemplify outstanding and unwavering dedication to animals in need, in the spirit of Bergh himself. In her acceptance speech, Lambert spoke about how animals have impacted her life and why it is so important to protect them. 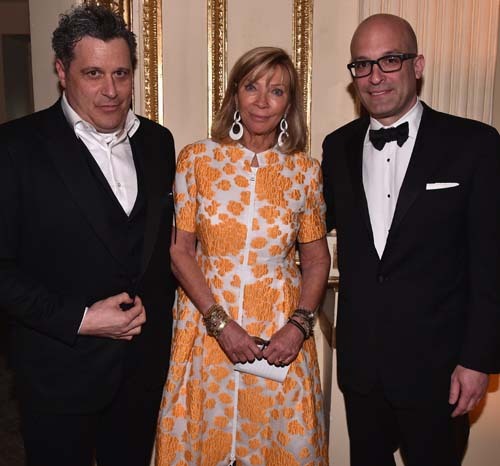 The Bergh Ball is a cornerstone of the ASPCA’s fundraising efforts to directly impact the lives of homeless, abused and vulnerable animals across the country. This year’s event raised more than $1.5 million for the cause. Sotheby’s senior auctioneer C. Hugh Hildesly hosted the live auction portion of the evening, which featured several high-end items and experiences, including Billy Joel front row concert tickets with a meet and great and a signed limited edition vinyl, as well as artwork from Hunt Slonem. Sponsored by Tuxedo Hudson Company and featuring décor design by David Beahm Experiences in collaboration with décor chair Robin Bell, the Bergh Ball’s event theme was “Shine a Light.” Event Chairs for this year’s Bergh Ball included Laura Zambelli Barket, Arriana and Dixon Boardman, Mindy and Thomas Fortin, Linda and Benjamin V. Lambert, Amy Lau, Paige Nelson and Rob Wiesenthal, Jeffrey A. Pfeifle, Laura and Frederick Tanne, Kim White and Kurt Wolfgruber. Associate Chairs included Paul Arnhold and Wes Gordon, Jessica Hart, Lake Bell, Amanda K. Ruisi, Allie Rizzo and Scott Sartiano, Christian Siriano and Brad Walsh, Jessie Schuster, Gillian Hearst Simonds and Christian Simonds. Notables on the Bergh Ball orange carpet include Carolina Herrera, Kimiko Glenn, Christian Siriano and Brad Walsh, Jessica Hart, Jill Rappaport and Jill Martin. The evening’s celebration also premiered the ASPCA After Dark party, a cocktail event following the Bergh Ball, which featured music by The Misshapes and a silent auction for young professional supporters of the ASPCA. Actress and star of Freeform’s hit show “Pretty Little Liars” Lucy Hale hosted the event. Notables on the After Dark orange carpet include ZZ Ward, Leigh Lezark, Bregje Heinen, Jerrod Niemann, Kimiko Glenn and Lo Bosworth. The After Dark event was supported by Bandier and Tito’s Handmade Vodka, and décor was provided by David Beahm Experiences. For 150 years, the ASPCA has made groundbreaking strides to protect the lives of vulnerable animals across the country. Through adoptions, animal health services, community outreach, field investigations, and legislative work, the ASPCA has helped countless animals live safer, healthier and happier lives. For more information about the 2017 Bergh Ball or After Dark, visit www.aspca.org/BerghBall or www.aspca.org/AfterDark. You can join the conversation on social media by tagging @ASPCA on Facebook, Twitter, and Instagram, and by using #BerghBall and #ASPCAAfterDark.